Painting Acrylic on 100% Acid Free Reg Paper | 7" x 7"
I desire to represent the unspoken and hidden emotions that delve inside all of us through paintings on a blank canvas. Also, it doesn’t matter in which form art has been employed as a means to mirror the reflection of our society and so, I use my artistic expressions to produce my own perspective on the evils and pitfalls of the society. This representation helps the society to notice its own follies which must be improvised and eradicated in order to maintain harmony on this planet. 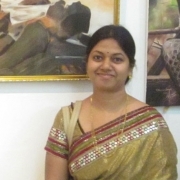 Born and brought up in Vijayawada, Janaki is multi-talented for she is not only an artist but also a freelance illustrator for web and local magazines, alongside her fully fledged profession as a software engineer in a Multinational company in Hyderabad. She holds a Master’s Degree in Fine Arts from Karnataka University as well. Her work’s artistic inventiveness has been displayed at various group as well as solo exhibitions nationwide. Moreover, her paintings have established a place for themselves at the residence of many serious art collectors in India and rest of the world.